Don't let the Walk of Stars end in Hollywood! Use these scrapbooking vacation layouts and ideas for your album to bring Hollywood to your scrapbook page. Consider creating a "Hollywood Star" with your name on it for your page's background. 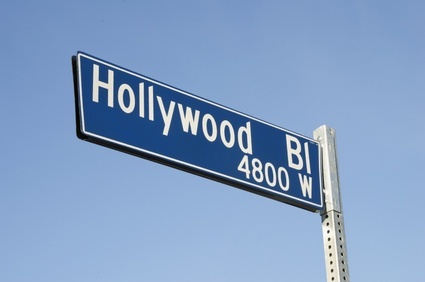 Then, place pictures of your time in Hollywood in the gaps between the points of the stars. Or did you take pictures of your favorite celebrities' stars? Crop the stars by cutting out the star shape. Place these cut-out stars randomly on a page. Be sure to leave space for a photo of your group somewhere on the page! Maybe the Chinese Theatre was your favorite part of Hollywood. If so, use handprint and footprint punches or stamps to add to your page! Another idea is to mat your group picture and place it on a page with the Hollywood sign on the top third of the page. You can create the Hollywood sign by using cardstock and block stencils. Or, if you want to save some money and skip the stencils, check out my technique using computer fonts. Using these Hollywood scrapbooking layouts, your page will make the "A-List!" Have You Created a Hollywood Scrapbook Page? Share your Hollywood Scrapbook Page for all to enjoy!